A microgrid can be defined as a localized grid that can connect to and disconnect from traditional utility grids to provide better reliability and grid resilience. A microgrid is an interconnection between distributed energy sources and loads within well-defined electric boundaries. It acts a single controllable entity. Microgrids can operate autonomously, due to which they are highly useful during main grid failures and they can help in mitigating risks arising out of grid disturbances and failures. Since a microgrid can easily connect to and disconnect from the main grid, it can operate in both grid-tied and island modes. Usage of microgrids offers several benefits such as grid modernization, integration of distributed energy generation sources including renewables, and integration of several smart grid technologies as well. It also helps in serving local loads from local power sources, resulting in the reduction of transmission and distribution losses and rise in overall efficiency of the system. Microgrids act as a support to macrogrids by handling the variability of power from local renewable sources and supplying ancillary services to sensitive loads and bulk power systems. Rising global population and increasing power demand have increased the dependence of end-users on utility grids to meet their power needs. According to the U.S. Energy Information Administration (EIA), the global energy consumption is expected to increase by around 56% by 2040. Moreover, the demand for energy is rising at a rapid pace, due to increasing industrialization and urbanization, which is not being fully met from main grids. As per the EIA, India and China have witnessed rapid industrial development and they are likely to account for 50% of the world’s total increase in energy usage by 2040. Industrial development in these countries as well as that in the U.S. is driving the global energy sector. One of the major drivers of the global microgrid market is direct and indirect economic, technical, environmental, and social benefits from use of microgrids. Moreover, microgrids facilitate making real-time power dispatch decisions, which helps in minimizing losses and maximizing profits. Advancements in renewable energy technologies are also anticipated to drive the market during the forecast period. Microgrids can easily utilize renewable energy systems to generate electricity. Moreover, usage of renewable energy sources in microgrids has been increasing owing to almost zero-carbon emissions and benefits in terms of efficiency and costs. One of the major operational challenges faced by microgrids relates to their functioning in an isolated mode. During this functioning, microgrids need to maintain stability with the help of distributed energy resources. Microgrids generally face instability during oversupply as well as undersupply of electricity. Oversupply of electricity may cause a generator to trip off, resulting in loss of power supply to a microgrid. On the other hand, undersupply of electricity can result in equipment malfunction. Another challenge relates to installation costs incurred when a microgrid is employed to replace a conventional grid. For efficient functioning of microgrids; system engineers, monitoring systems, and relays need to be incorporated. This can significantly increase installation costs of a microgrid compared to a macrogrid. Lack of a well-defined regulatory policy framework is another restraint of the microgrid market. Ambiguous state laws pose a major obstacle in the path of microgrid deployment. One of the major challenges faced by macrogrids is instability of the grid in the event of severe weather or a natural disaster. This can be easily encountered by using a microgrid. On-site microgrid systems can be designed to operate during tornadoes, floods, and earthquakes. Moreover, these systems act as substitutes for conventional grids at the time of power outage. Governments are especially developing plans to strategically place microgrids near pharmacies, hospitals, police stations, gas stations, and grocery stores in order to cope with such an emergency situation. Based on region, the global microgrid market can be segmented into North America, Latin America, Europe, Asia Pacific, and Middle East & Africa. Asia Pacific dominated the global microgrid market in 2017. This can be primarily ascribed to low electrification rate and grid connectivity along with high demand for power in the region. The market in Asia Pacific is anticipated to expand at a significant pace during the forecast period, primarily due to rapid industrialization and urbanization in the region, especially in China and India. Also, governments of countries in Asia Pacific are planning to promote distributed energy generation and microgrids in order to supply electricity to people in these countries. Key players operating in the global microgrid market are Siemens AG, General Electric, S&C Electric Company, ABB Group, Schneider Electric SE, Engie Group, Honeywell International Inc., Echelon Corporation, Pareto Energy Limited, Toshiba Corporation, Duke Energy Corporation, and Power Analytics Corporation. This report analyzes and forecasts the market for microgrid at the global and regional levels. The market has been forecast in terms of volume (megawatt) and value (US$ Mn) from 2018 to 2026, considering 2017 as the base year. The study includes drivers and restraints of the global microgrid market. It also covers the anticipated impact of these drivers and restraints on the demand for microgrids during the forecast period. The report highlights opportunities in the microgrid market at the global and regional levels. The report includes detailed value chain analysis, which provides a comprehensive view of the global microgrid market. Porter’s five forces model for the microgrid market has also been included to help understand the competition landscape of the market. The study encompasses market attractiveness analysis, wherein connectivity and application segments have been benchmarked based on their market size, growth rate, and general attractiveness. 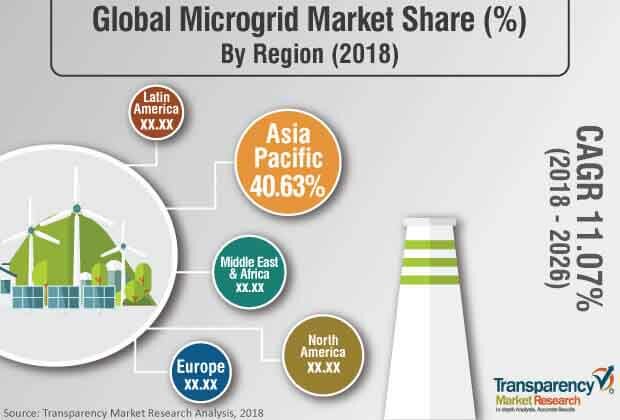 The study provides a decisive view of the global microgrid market by segmenting it in terms of connectivity and application. In terms of connectivity, the market can be classified into grid-tied (grid-connected) and off-grid. Based on application, the microgrid market can be categorized into campus & institution, community & utility, commercial & industrial, defense & military, and remote island. These segments have been analyzed based on the present and future trends. Regional segmentation includes the current and forecast demand for microgrid in North America, Europe, Asia Pacific, Latin America, and Middle East & Africa.